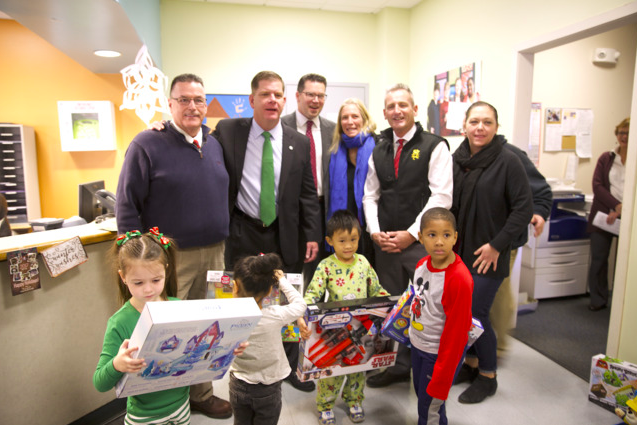 IUPAT District Council 35 leadership was joined by Boston Mayor Marty Walsh in presenting the Dorchester Boys & Girls Club a $10,000 donation and toys. Dorchester, MA – On Thursday, December 21, 2017, Boston Mayor Martin J. Walsh joined the International Union of Painters and Allied Trades District Council 35 to present the Dorchester Boys & Girls Club a $10,000 check and toys. The donation will help fund more than 200 programs offered by the Club to over 4000 children in the community. “DC35 is committed to helping communities and building the future of Boston. We are proud to donate this money to the Dorchester Boys & Girls Club that provides much-needed assistance and support to children. In light of the opioid crisis, safe and stable environments like this Club are important now more than ever,” said Jeff Sullivan, Business Manager/Secretary-Treasurer of DC35.